Several of the previous posts have shown buildings that have fallen victim to the wrecking ball. 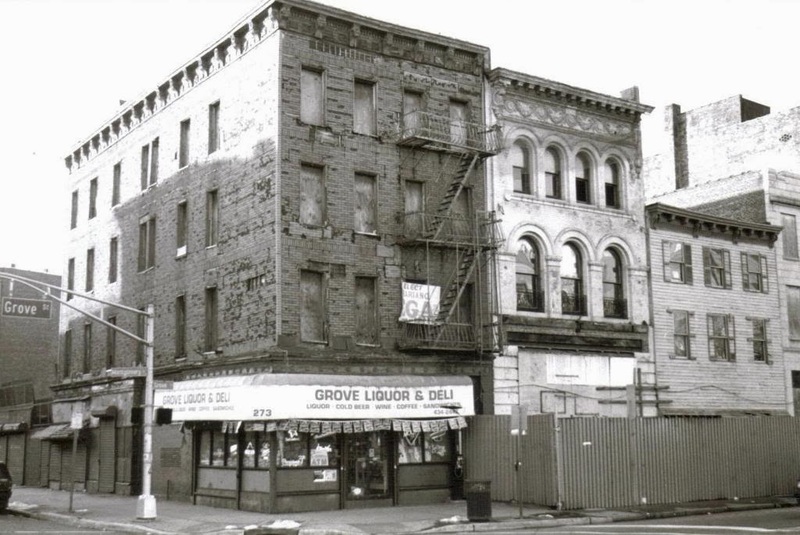 In this post I would like to highlight a couple of blighted buildings that were not only saved from demolition - but actually restored to their original glory. I particularly like this renovation as it is highlights the dramatic improvements that can be done when restoring wood frame buildings. When the architectural details are removed from these kinds of buildings or covered up with vinyl (or other) siding, they look uninspiring to say the least. But with some care in the form of decorative trim around windows and doors as well as rebuilt cornices, they can be brought back to life. There are plenty of single family wood frame buildings in Jersey City, that could do with some of this kind of TLC. There are also some that have been given the treatment already - e.g. around the intersection of Monmouth and 8th St. I would like to thank Alex Frazier for letting me use the picture that he took around 2000. 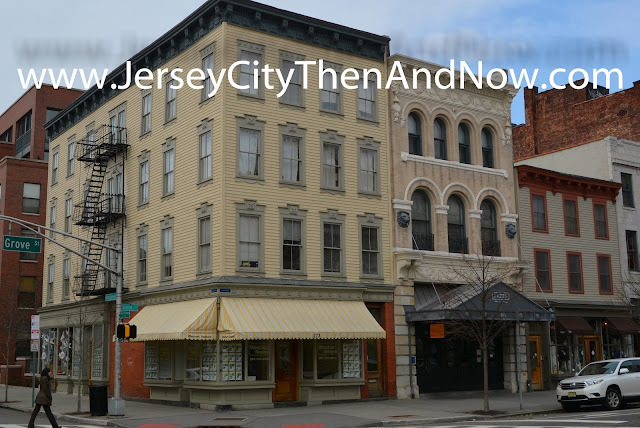 This was before the 'upswing' of downtown Jersey City has started. Some of his other pictures can be found here. This one, showing what the Beechwood Cafe at Grove and Mercer used to look at before rehabilitation, is just one of the interesting ones. The photos were taken from south-east corner of the intersection between Montgomery and Grove Street - towards the north west. The 'then' photo shows the site before the rehabilitation started, and the 'now' photo is from 2013. The redevelopment was done around 2005 by Silverman - an active local developer that also built Hamilton Square on Hamilton Park. As of February 2014, Silverman's has just started building the Majestic II project diagonally across the intersection, at the exact location where the then/now photos were taken from. A rendition of the new building's facade can be found here. What do you think of the Majestic II building - will it enhance the look of the area? Use the comments below. 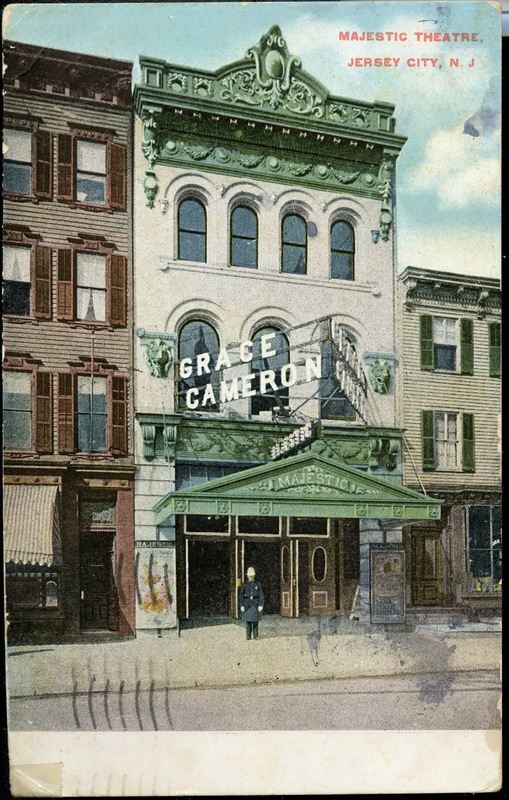 The post card below shows the Majestic theater approximately 1910 - this is the building in the middle above. Apparently Mayor Hague had Mae West arrested while performing at the theater. There is more information at New Jersey City University's JC history page: http://www.njcu.edu/programs/jchistory/pages/m_pages/majestic_theater.htm. Have you got something to add to the text above? Do you know something about any of the buildings in the photos? Please use the comments functionality at the bottom of page - would love to hear from you! The pre-renovation photo from 2000 is used with kind permission from Alex Frazier, while the postcard and new photo is in my collection.